For most Americans the internet seems like it is just there. The sites and services either work or don’t. We have become so accustom to poorly designed operating systems and faulty connections that we don’t notice, when the toll trolls appear. The gate keepers and toll barriers to connect to the internet are the companies; we pay to give us access. Most of the companies we use at home or at work are the only choice. This was decided for us long ago when our state and local communities made exclusive agreements with providers of cable and land based telephone. The agreements fostered local monopolies to be created. As a result, regulation was instituted and the somewhat happy consumer was sort of satisfied with a level of service. Then came along the internet and high definition television who’s signal are exclusively digital. The telephone provider at first offered internet then branched into television. The cable providers offered television and internet and branched into telephone. The lines and services became blurred and both competed for the same customer base. The internet also offers television programming and telephone service. Thus the competing services on the net are offered for a much lowered price or often for free. This upset the trolls collecting the tolls on our access to the internet. A rebellion then began by the trolls who started blocking or slowing down access to internet sites offering competing services. The regulators shot back and launched a volley of paper airplanes as they are currently powerless to regulate the services on the internet. On Jan. 14th 2014, a federal court of appeals struck down the Federal Communications Commission’s Open Internet Order, which was designed to prevent Internet service providers from blocking or slowing users’ connections to online content. 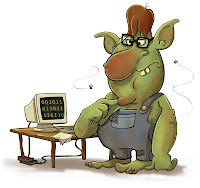 The trolls won the first battle hidden the darkness of your connection, all the while convincing the consumers that the internet services were inconsistent and not as reliable as the trolls competing service. Many hapless consumers fell into the trap, the troll just killed the service running on your computer or phone and you blamed the service. Who would of thought of a troll being a barrier to free applications and programming. It was after all the appeal of the free services that the trolls use in marketing material to sell the internet service. The problems that we face are not what the internet service providers want to do. As long as we are stuck with only one company in our area providing high speed access to the internet we will be at the mercy of the regulatory actions. Personally I don’t understand why the cable companies need to be protected anymore anyway. The problem is brought on by regulation of the industry. Regulation also is why we have hundreds of channels we don’t watch and have to pay for. Not all regulation is bad however, sparsely populated areas need regulation so communities have a connection. Being stuck under the guise of regulation blocks our choice to internet a wide array of internet connection points. Many areas in the world WiMax is used offering high speed and long distant connections to the internet. If the FCC would allow consumers to use WiMax then anyone could provide completion to the big cable carriers. The internet is free open and inherently dangerous. Taming the internet though censorship is the is what the argument over net neutrality is all about.